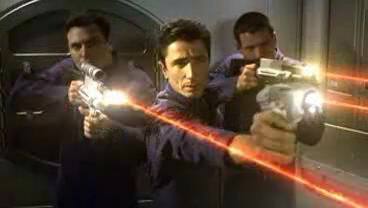 Plasma-based rifle carried by Starfleet personnel prior to the introduction of phaser rifles. 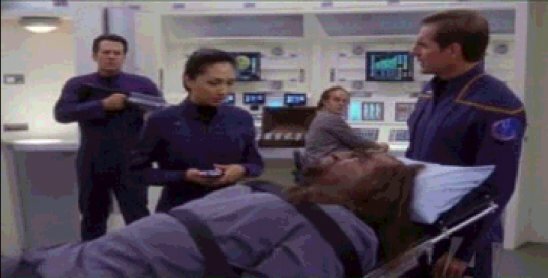 The name "Class-3" is established in the episode "Fight or Flight" and is only hypothetically applied to the rfile we've seen used in Enterprise. The rifle originally fired bolts rather than beams (hence the name!). 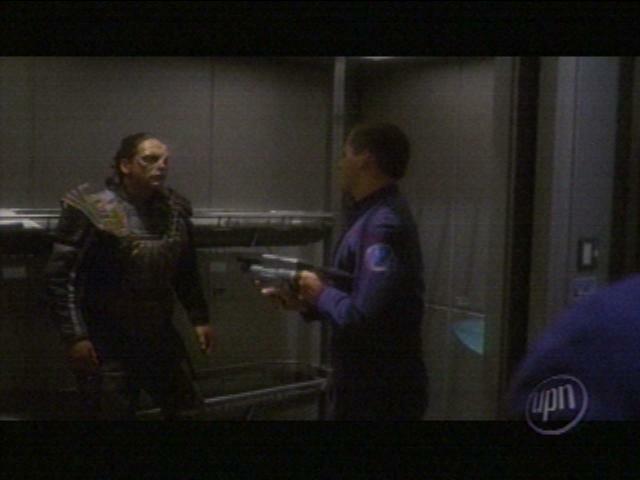 The prop is a redress of the Jem'Hadar disruptor rifle, which itself had already appeared in the 1st-season DS9 episode "Captive Pursuit;" this we can explain easily by saying the Hunters purchased (or even stole) the design from their Gamma Quadrant neighbours (or even rulers) the Dominion. 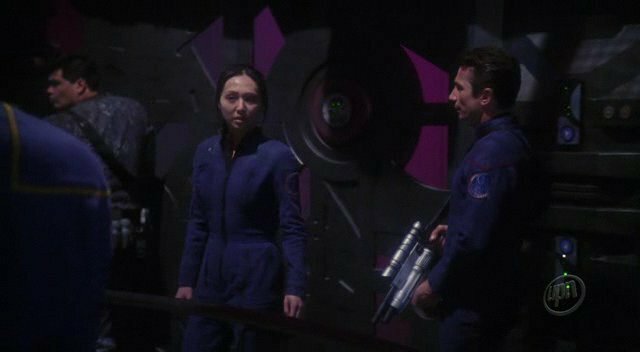 Of course, the Hunter weapons had a pair of silly crossbow-style wings (vertical rather than horizontal) - but then their dress-sense was rubbish, so we can overlook that! 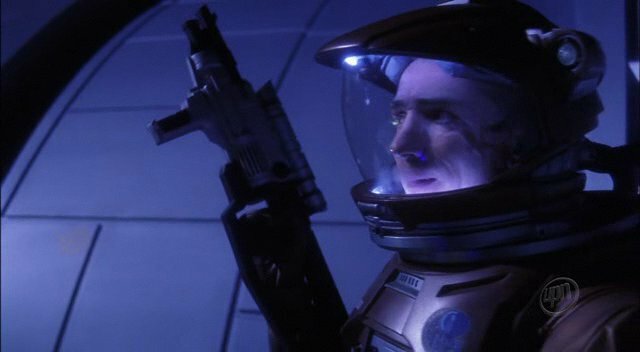 The modifications, which I've attempted ro recreate in the above image based on the Jem'Hadar rifle, include a forward pistol grip and extended conical muzzle (reminiscent of the American MP-3 "Grease Gun" used in WWII). As for the coincidental similarity of the Class-3, it'll just have to be categorised as "one of those things." 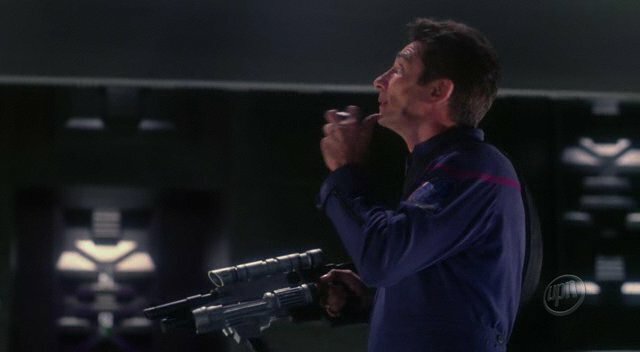 The weapon presumably isn't going to feature very much in Enterprise, although it's since appeared in the episodes "Cold Front" and "Sleeping Dogs." 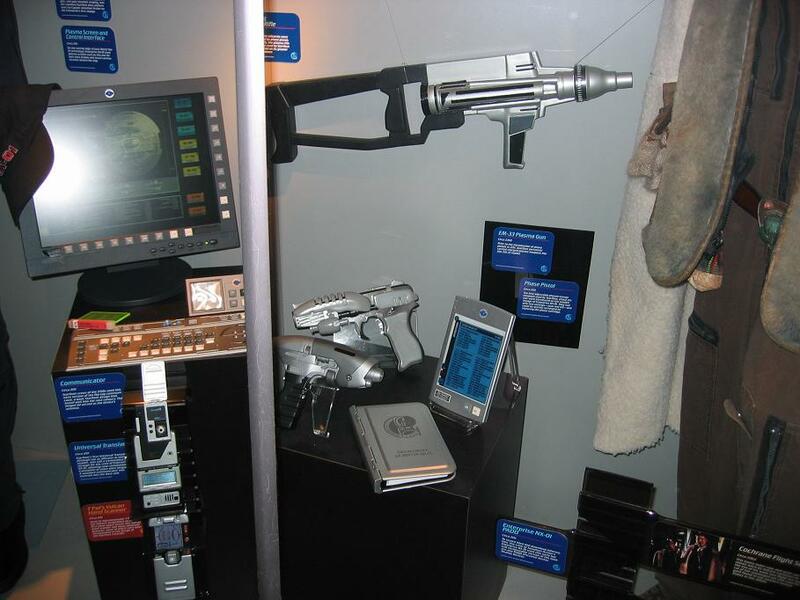 If nothing else, it explains why Kirk had (what appeared to be) a Jem'Hadar rifle in his wall display in Star Trek: Generations! 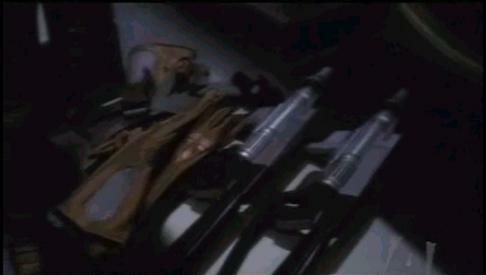 The Class-3 variant first appeared in the episode "Fortunate Son" as carried on the civilian cargo ship Fortunate (and subsequently on the Enterprise in another season 1 episode): it appears to be the same weapon, but with a drastically-altered muzzle assembly consisting of what looks like two over-under barrels. 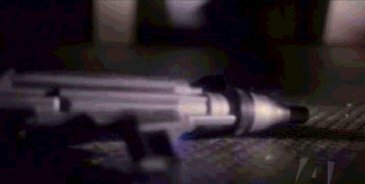 What difference there is between this weapon and the Class-3, and the reason for the designing of this prop, remain unknown. 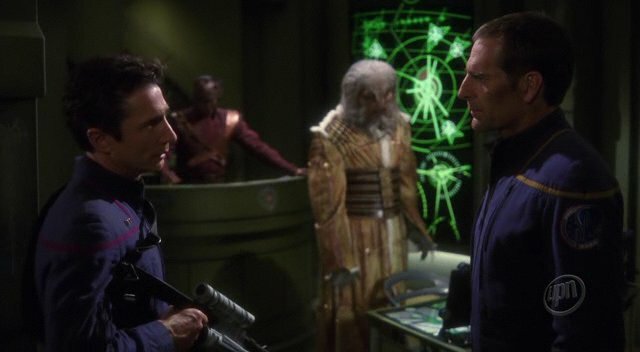 In season 2 the variant reappeared, first in "Marauders" as used by Lt. Reed in sniping mode, but also - and perhaps more significantly - in "Singularity" on a rack in the armoury: about 10 rifles, equally divided between the two versions! 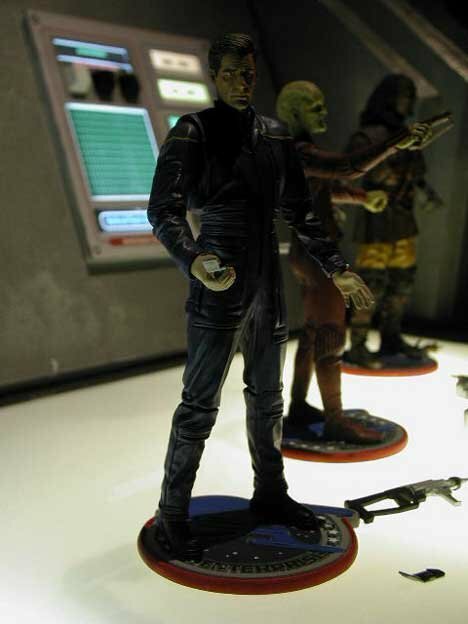 Confusing the issue is the Borg comeback/prequel (!) 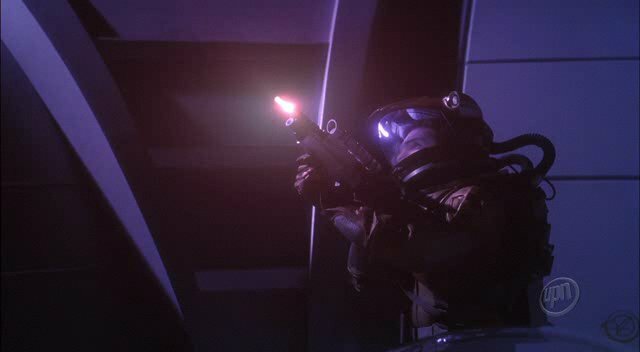 episode "Regeneration" in which the variant is now seen to fire beams identical in FX to that of the Phase Pistol, and to have variable settings, as ordered when the first shots don't affect the drones. 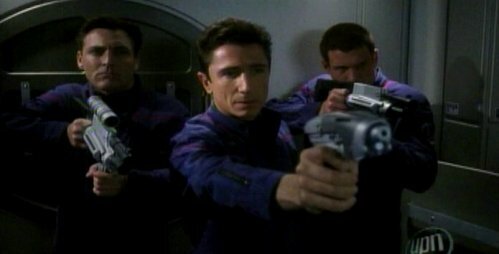 Is the variant the promised Phase Rifle? 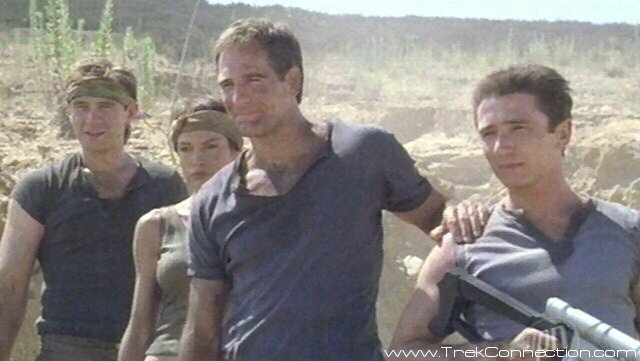 If so, how come a civilian transport like the Fortunate would have them? 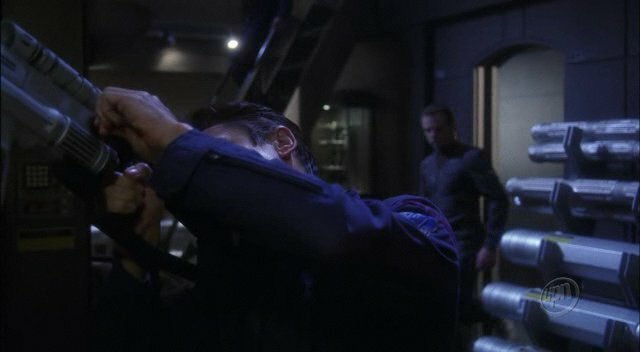 It's also worth mentioning that of the two seen, one prop has a sniper scope, the other doesn't. 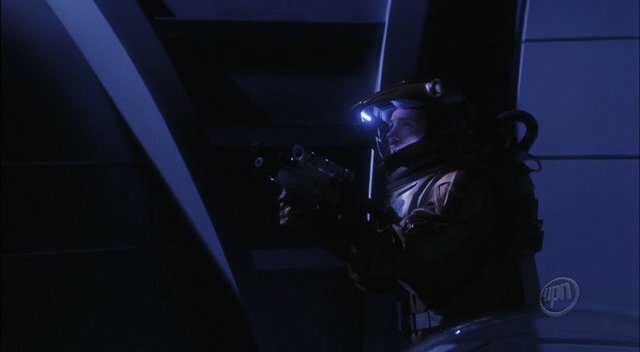 In season 3 the variant rifle remains prominent: the pirates in "Anomaly" are seen to help themselves to the ones in the rack, and a "case of plasma rifles" is listed among the stolen items; the captured pirate is guarded by an Enterprise crewman carrying one. 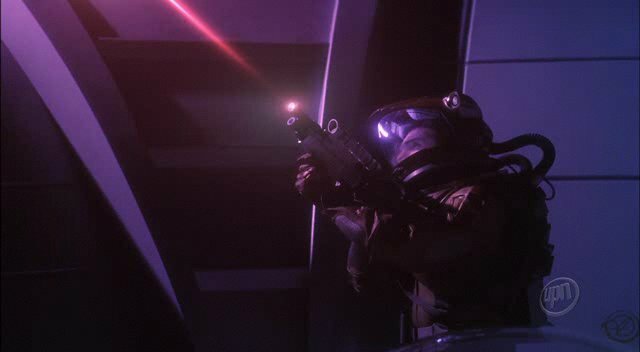 Why they remain when the MACO rifles appear superior (so far) is a mystery. 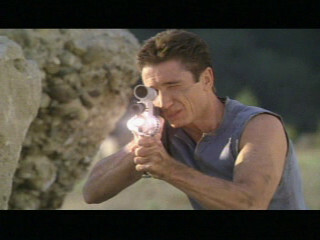 Jason Atkins says: "What I'm thinking, is that the second version was designed for more sniper-esque shooting. 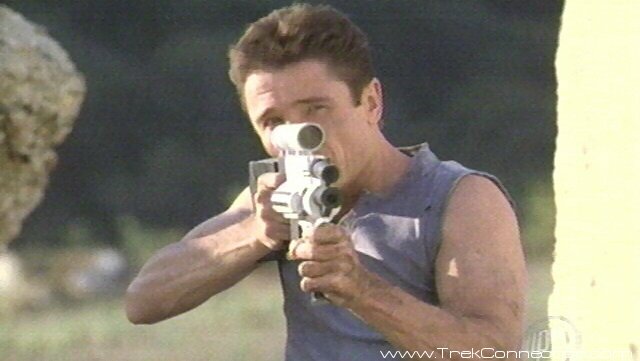 It's designed to be more of a one-shot per target kind of gun. 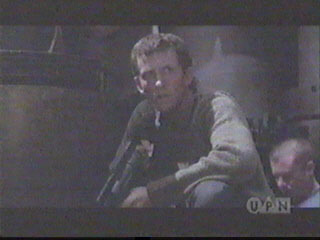 If you think of it as a rifle, and the standard version as a sub machine gun (let's say an MP5), it might help. 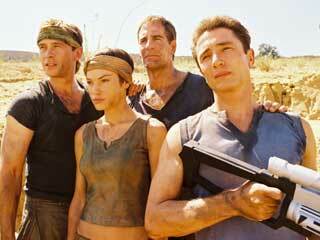 With a rifle, because of its rate of fire, you're careful of when you pull the trigger. 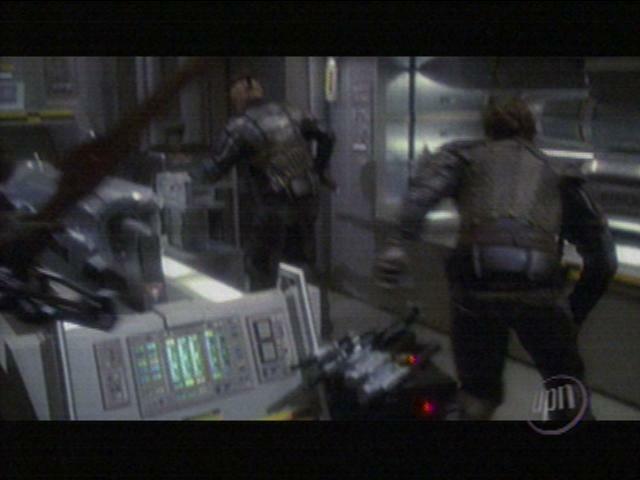 However, as we so often see in things like Stargate SG-1 (although they use P-90's now) and a whole load of other army films, you're supposed to blanket the target in bullets with an SMG. Maybe that's the idea with the two Class 3's. . . 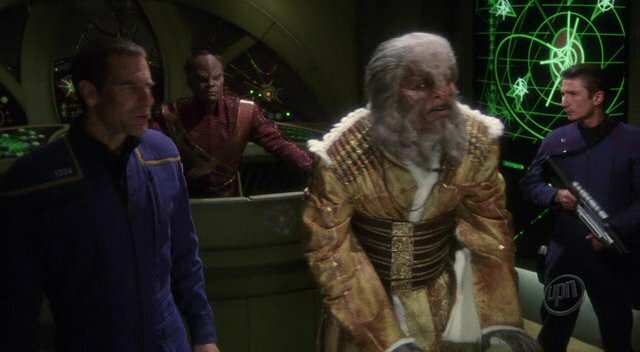 I've just realised a flaw in either mine or Starfleets logic though. 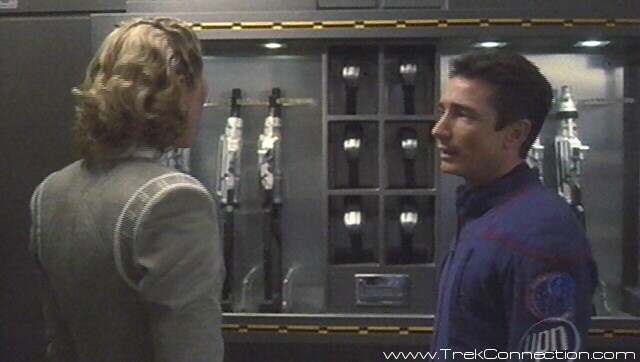 . . if you're inside your own ship, you won't want to be shooting up the walls. 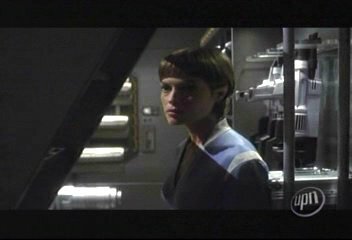 Oh well, if Starfleet can make Janeway an admiral, I'm sure they can encourage the internal devastation of their ships. After all, it gives the engineers something to do!" 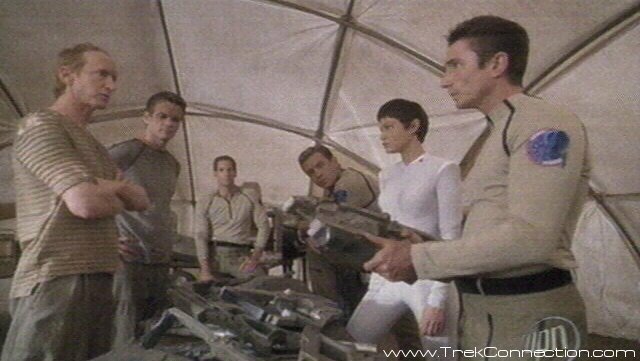 Peter says: "I had a theory about the Pulse Rifle from Enterprise that may explain the variant and FX confusion. 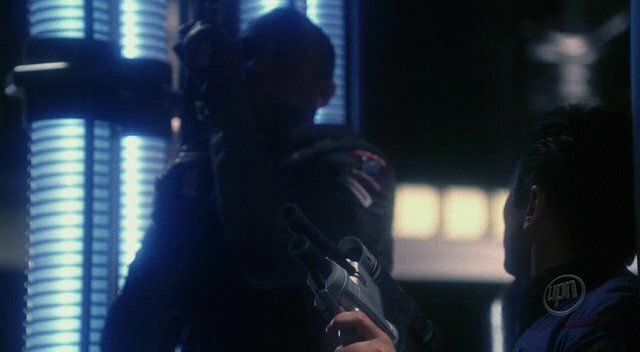 The second variant of the rifle, the over and under design, I think is a Pulse/Phase Rifle combo weapon, like a M16/M203. 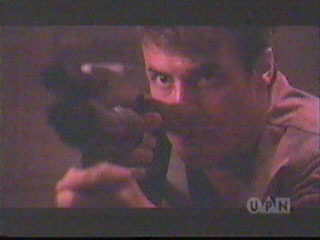 If you notice in "Marauders," Reed uses the rifle. 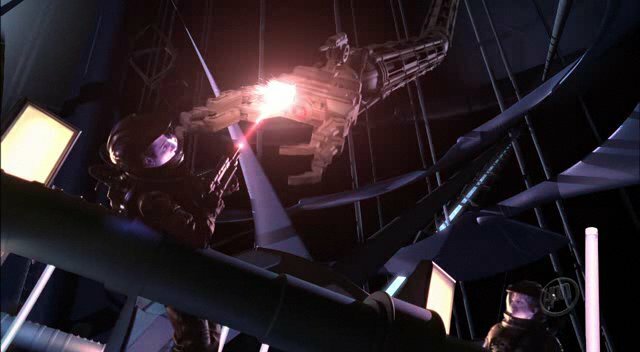 The pulses he fires come out of the lower barrel. 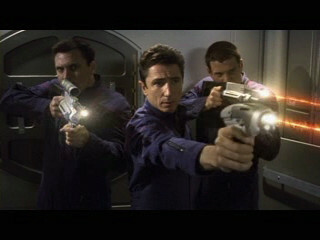 In "Regeneration," the phase beams come out of the upper barrel. Obviously, having a combo weapon would provide advantages. 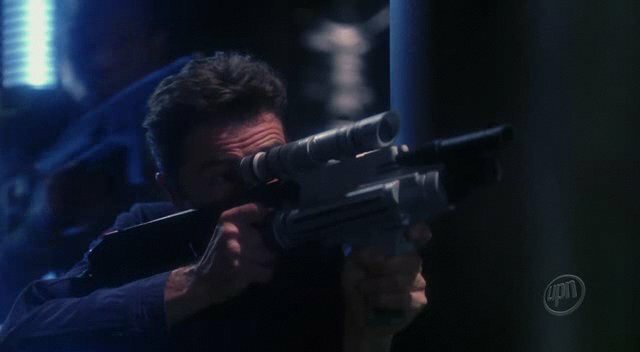 The pulse rifle could have a better range then the phase weapon, thus why Reed sniped with it (with a scope, to make use of its range). 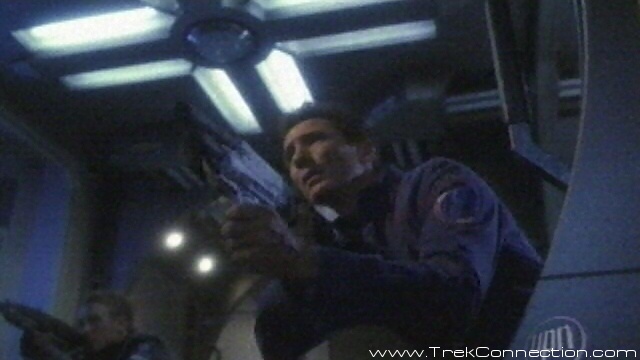 The Phase part of the rifle has the variable settings. 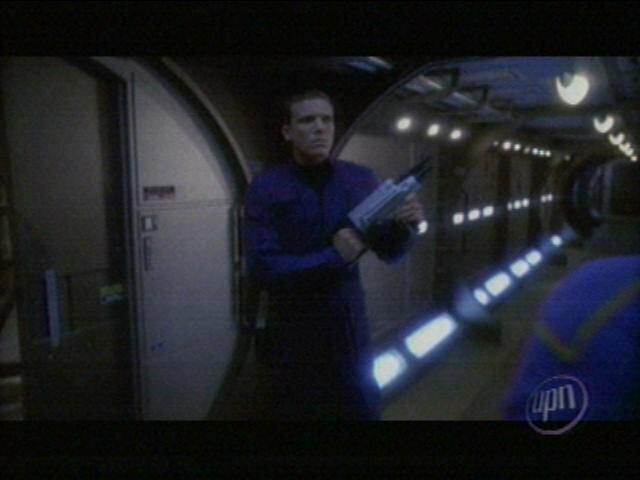 The weapon could have been an older rifle version (thus why it was carried about the Fortunate), and the upper barrel could have been a second pulse barrel or some targeting sensor that was replaced with a phaser weapon. 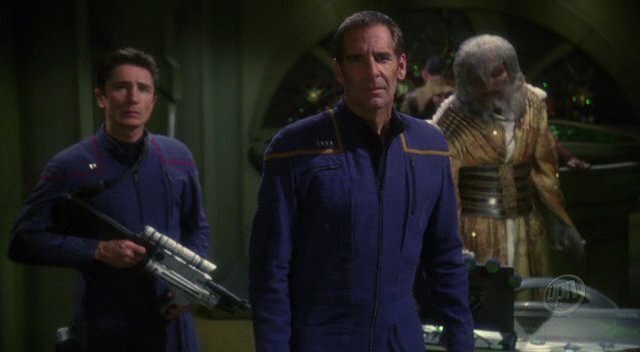 Because Starfleet particle weapons are still in their infancy, personnel may still prefer trusted plasma weapons as heavier weapons, and the combo is like a transition phase." 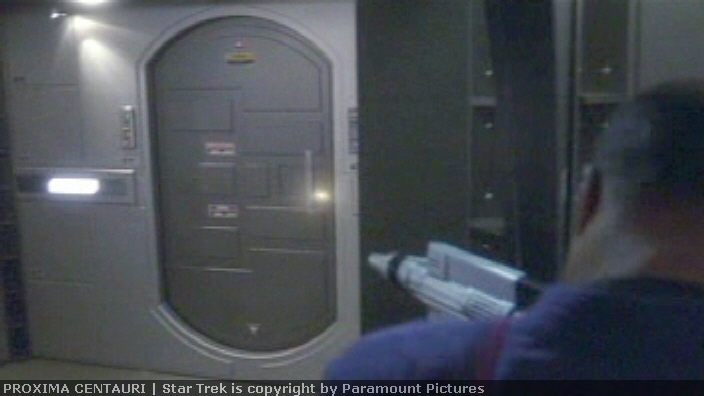 Scott Anderson has now been able to confirm this - the lower barrel fires pulses, the upper barrel fires beams. 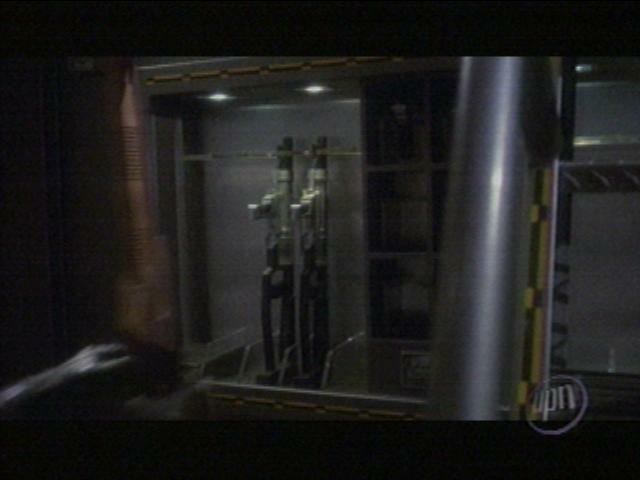 That is, until "Zero Hour" where pulses are seen to come from the upper barrel. 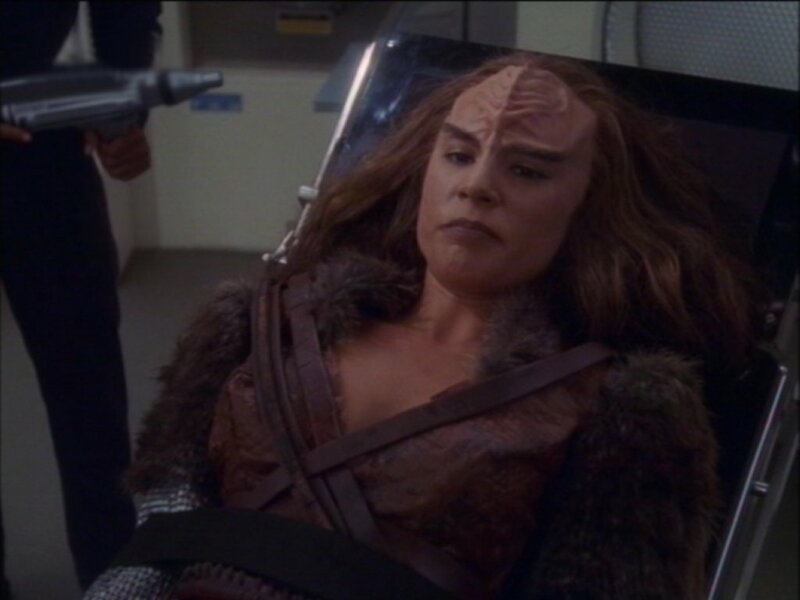 . .
Matthew Barlow suggests that perhaps the variant is one that was improvised on board the Enterprise prior to its return to Earth at the end os season 2. 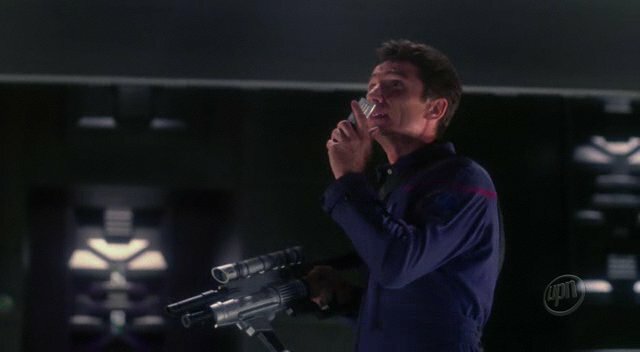 I'm a bit dubious, since I was never too convinced about the way they managed to complete & install their phase cannons while still in deep space; designing a new type of rifle, however much Lt. Reed might like to, seems a bit beyond them!